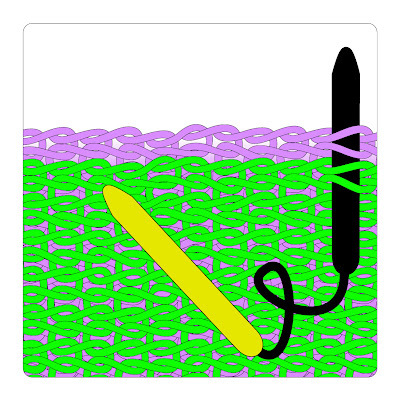 In the illustrations below, two pieces of stockinette, one green and one purple, are being matched to make sure they have the same number of rows knitted. The illustrations all show the matching proceeding from right to left--the same way as knitting. However, there is no science to this--you can proceed from left to right just as well. First, fold both pieces to be matched so that one column from each piece is just at the fold line, then hold the folded pieces pressed together. Pick the plainest possible columns in the work, a column with as few pattern complications as possible--ideal is a column of stockinette stitch in each item. 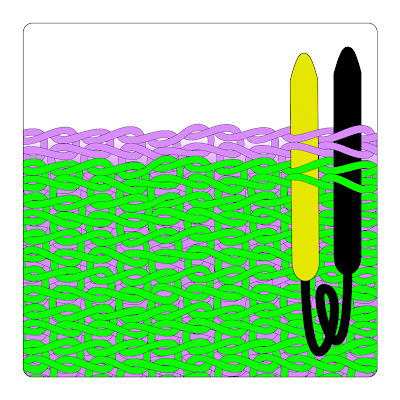 Per the illustration below, use one point of the circular needle to poke through both arms of the first stitch of the chosen column in the front piece (green), then poke the same needle through both arms of the first stitch of the chosen column in the back piece (purple). 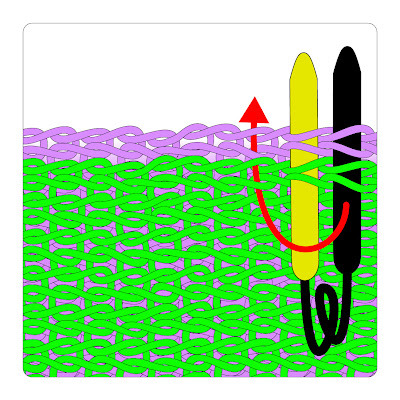 The first point (illustrated in black) is fully inserted under the first stitch in the folded column of the green fabric AND the first stitch of the folded column of the purple fabric. With the second point of the circular needle (illustrated in yellow) poke through the next stitch along the row on the folded column of each piece. As shown below, you now have two needle points poking through two stitches on each of the two pieces of your work. As shown by the red arrow in the illustration below, the next step will be to remove the black needle and poke it through the third stitch along the folded columns. 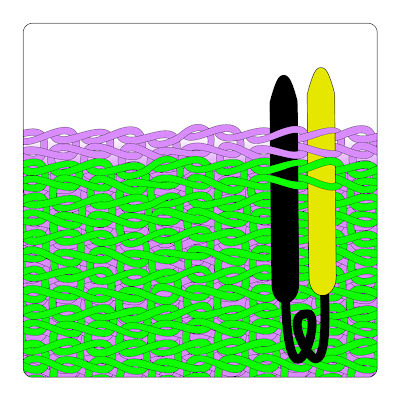 In other words, you are going to leapfrog the first needle past the second--moving the black needle from the first stitch to the third stitch in the folded column of both pieces. As shown below, you now again have two needles poking though the work. The reason I prefer a circular needle for matching is because it is harder to drop one needle as you do the leapfrogging part of the trick. However, if you do not have a small-gauge circular needle, small thin regular needles or dpn's will also work well. As shown below, you continue in this manner, leapfrogging each needle one additional stitch up the folded columns, moving each needle in turn. When you reach about 15 or 20 rows, run a safety pin (more secure) or a bobby pin (much, much faster) through a matched stitch. There is no particular science to the placement of the pin--the idea is to place pins often enough so that if you DO lose track, you don't have to go very far back to re-start the matching process. When you get to the top of each column, you will easily see whether your two pieces match--does the last needle inserted go through the top stitch of each column, or does one column extend further? If so, either pull out the excess rows of the longer item, or knit extra rows on the shorter item. Matching is EASIER than counting--in both counting and matching you have to identify the next stitch but counting requires you to keep track the number of stitches, whereas matching does not. Obviously, you CAN count while matching--if you ARE counting, insert pins every 10 or 20 rows exactly to ease your double-check when you re-count--but the point is that with matching, you don't actually NEED to count--"losing count" is no impediment. Matching is FASTER than counting--because you are poking both items at once, it goes twice as fast as counting each item, one at a time. If you have made beautiful, regular edges (by a chain selvedge or any other method) you can match along the edges, rather than along a folded column. However, experience dictates that in many cases, matching along a column is more accurate than along an edge, and this is especially true if there has been shaping along the edge. The above illustrations and instructions show how to match length, row by row. The same procedure also works to match width, stitch by stitch (checking the width of two sleeves as they are increased, for example). Simply fold the two pieces so that there are two adjoining rows, then poke matching stitches along the row to count stitches.